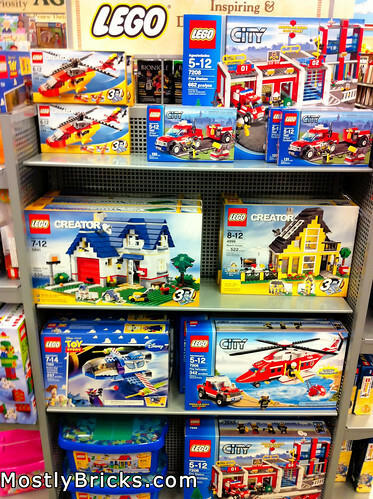 I’m always interested in how LEGO is portrayed and sold in other stores outside of the official LEGO retail stores. I’m lucky enough to have had a LEGO retail store open up in my area in the past year, which means no more sporadic trips to the LEGO stores in Houston or Dallas when I’m visiting family and friends there. 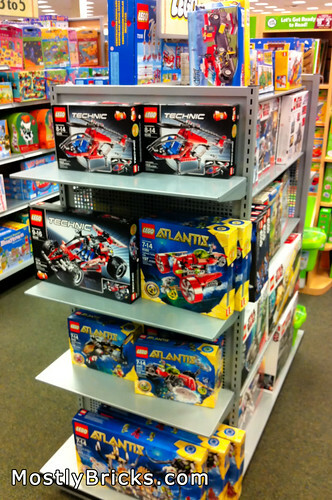 Now of course, I’ve got plenty of Targets, Wal-Marts, even Sears, in my area, with plenty of LEGO sets to choose from. I can’t forget Toys R Us as well – have a couple of those. 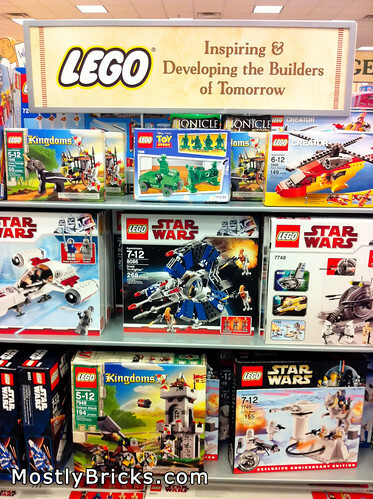 There is one place that has quite a few LEGO sets available, as well as some nice displays, that often gets overlooked, and they happen to carry LEGO-related items that the other non-LEGO retail stores don’t necessarily carry. I’m of course referring to Barnes and Noble. 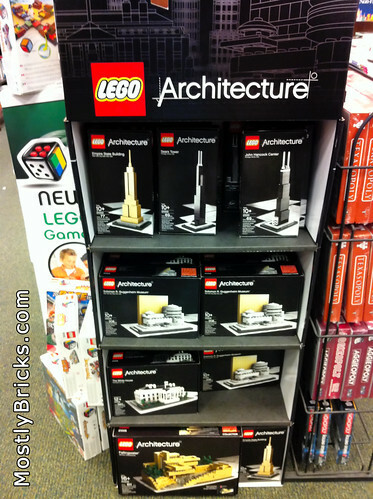 I visit the one in south Austin occasionally, and this time around I decided to take some photos of their LEGO sets and displays, because I don’t think most people realize what all they have – they aren’t just selling books, magazines, food and movies/music. 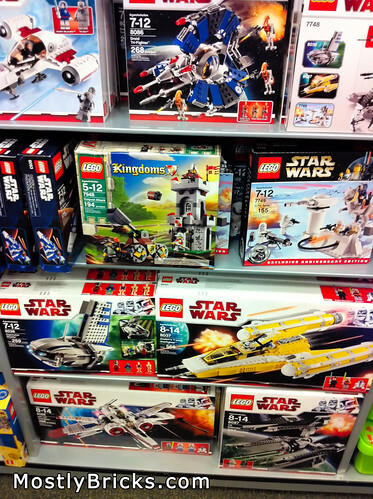 They’ve been adding a toy and hobby section, and the one I visit has quite a bit of LEGO-related items. The store I’m referring to, they obviously have put some effort into the LEGO displays – I’m not familiar with other stores, but I am impressed with this one. 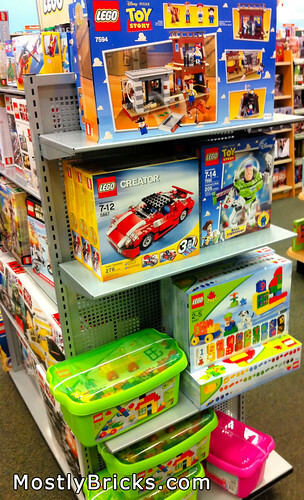 * The main LEGO display was fairly prominent – it had it’s own little dedicated section in the middle of the toys and hobby section. 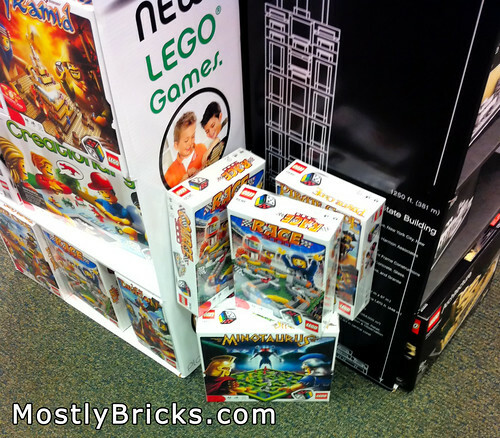 * The LEGO alarm clock/flashlights were in another part of the toys & hobby section. 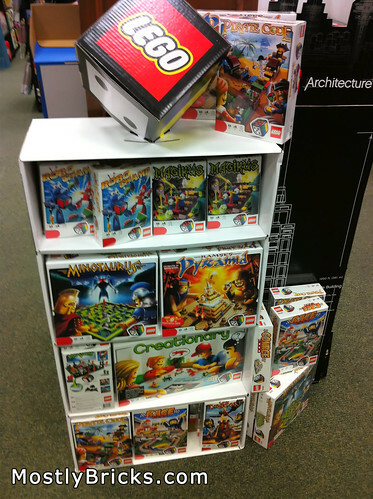 * The LEGO games and the LEGO Architecture displays were next to one another, however they were off in the game section of Barnes & Noble and weren’t near the main LEGO display. They were still easy to find. 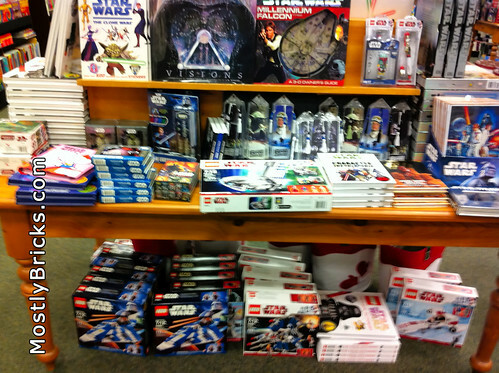 * I did a really poor job of taking photos of the LEGO Harry Potter and LEGO Star Wars stuff! 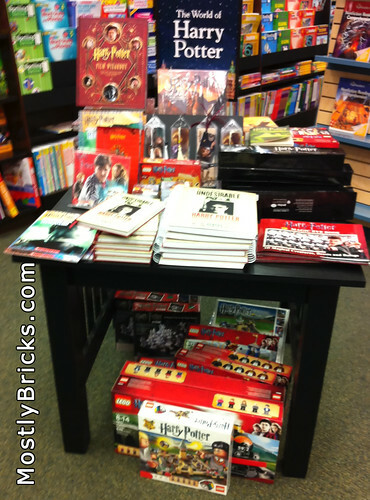 Anyways, here are some photos of the various LEGO displays in our favorite B&N. I apologize for the poor picture quality – I’m not using a flash in a store, and I’m not the steadiest of hands when it comes to photo taking. You can click on any of them to take you to a larger version at flickr. Full gallery at flickr if you want to see higher resolution versions, or just click on the photos above and they’ll take you to flickr.